Mid-week is hallowed ground for ski touring, given the outdoor recreation’s rise in popularity. On any given weekend, the touring dirtbags skinning up the Eightmile Road (a spur to the Icicle Road) would be sure to encounter whining snowmobiles zipping past, whining urbanites on snowshoes, and the odd hound leaving its mark on your skin track. Me, I’ll take any given Thursday for my tour of Eightmile Mountain, thank you very much! No noise other than my steady “thunk” of skis striding upward. I can’t complain about the weather. Sure, it’s been a low-snow winter, but we’ve had spectacular bluebird days as compensation. Today is one of those. But we’ve also actually received about 7 inches of eastside powder in the last few days, and I know anything facing north has the potential to be lovely skiing. The northeast face of Eightmile Mountain fits that bill. It’s relatively steep and has many options of lines ranging from really committing to conservatively committing. Photo Right: The prize, the NE Face of Eightmile Mtn. 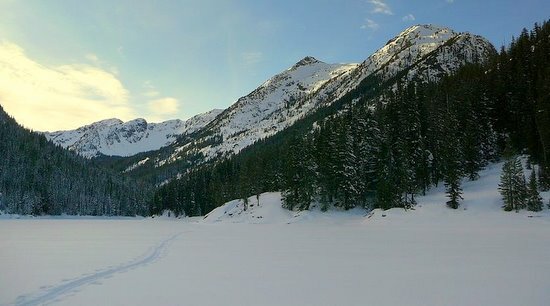 A few hours from the car, I ski over the middle of Eightmile Lake, not because I have to, but because I’ve come to savor the eerie feeling of walking on water. It’s hard to describe, but depth perception is thrown off in the process. I know I’m moving, but there is so much space between me and the surrounding peaks, it feels like I’m stationary. I’m skinning over smooth ice, so I don’t have to keep looking down, but can now just look forward and up at the looming spires. This seems to exaggerate the disorientation. I reach the end of the lake, and follow the creek upward to the first avalanche path below 8 Mile’s south slope. I ascend in corn snow, sun radiating off and pelting my unprotected face. It feels like spring! Photo Left: Mt Stuart showing off while climbing the south-side of Eightmile Mtn. I lean forward enough to get my skis sliding and take two long ski-cutting turns and bounce gingerly to see if I can get the slope to settle. Nothing. Okay, I may as well ski the rest. The top 500 feet is pitched at about 40 degrees–steep enough to give you a weightless feeling with each hop. Each turn my smile gets bigger, as my skis porpoise in and out of soft powder. These are hero turns. I stop about 700 feet down and look back up, breathing hard and laughing incredulously at this ‘stoke’ of good fortune that’s been so elusive this year. Backcountry skier vanity at its worst. Admiring my turns, the slope my canvas, the powder my paint. If I weren’t so tired, I’d climb back up for a second lap. The fun is over as soon as I hit the breakable crust at the bottom of the face. I traverse out, looking back every once in a while to make sure it was real. Soon enough, it gets plenty real as I have to dodge and weave around dense trees and windfall on my way back to the lake. There is no graceful linking of turns here. It’s an exhausting hop, skid, stop; hop, skid, stop all the way back down to the lake. But soon enough I get there. It’s refreshing to leave the claustrophobia of dense trees to the wide open expanse of the lake, that it takes time for the senses to readjust. I begin to move, reversing my entrance, and I’m once again walking on water… and on air given all this much earned solitude. 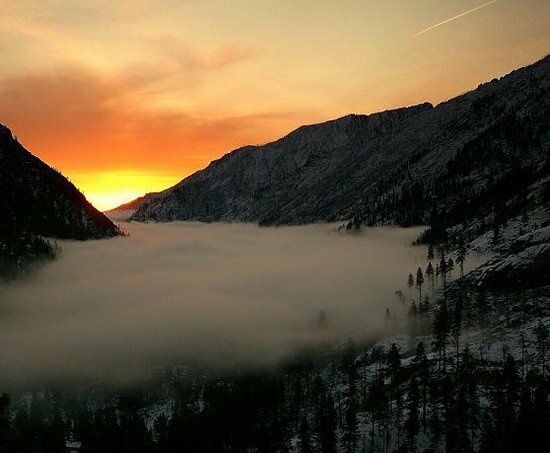 Go another half mile west of the lake and at a big clearing with an unobstructed view of the summit, start the serious climbing up southeastern and southern slopes to the summit (7,996 feet). This is a 3,000 vertical foot hoof. The descent of the NE face is quite steep at the top but moderates some if you start farther to skier’s left. The descent funnels into a drainage hooking into west end of Eightmile Lake. The top 600 vertical feet of the top are steepest, most avalanche prone, and trickiest to navigate because there are cliff bands to skirt. You may want to climb the route before skiing it to assess the snow quality and consistency…and to scout the best line for skirting the cliff bands. Hazards. 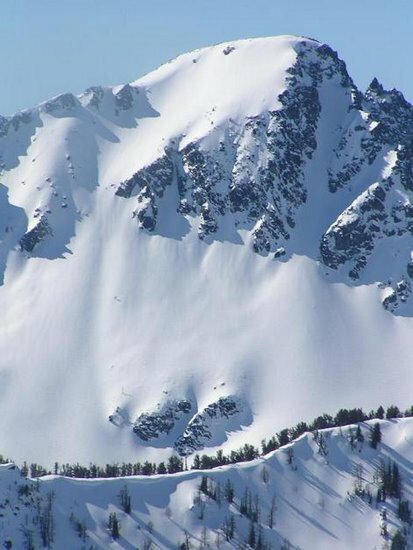 Big avalanches sweep the southern, northeastern, and eastern slopes of this peak. 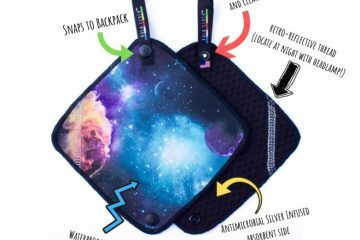 Know your shtuff (and your snow) if you ski or snowshoe the peak. Maps. 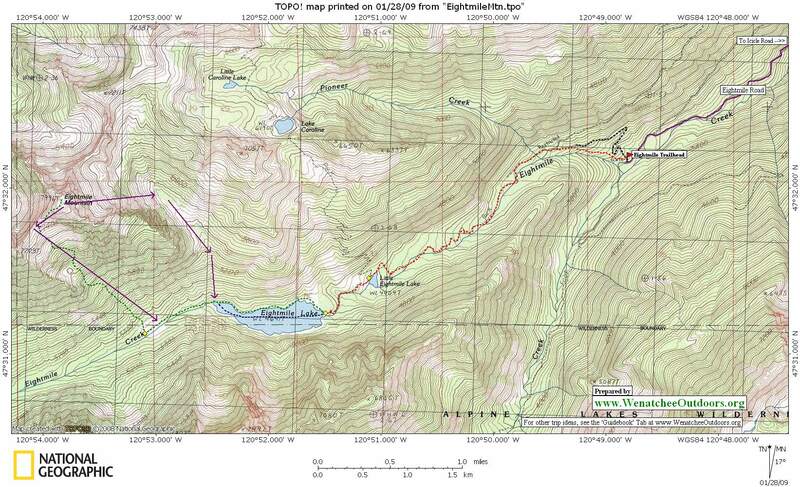 Print our topo map below on 8.5”x14” paper in landscape mode. Note: Use ‘Print Preview’ first to properly orient and scale the map to your printer.